We have added a new focus light to the first quadrant, this time their projetantes are directed to the Profile Plan. Finally we call ‘Profile Projection’ which was formerly known as ‘Left Side’. At this time we removed the three-dimensional object, leaving its two-dimensional projections: front, top and profile in their respective projection planes. It happens that this system is still dihedral dimensional. Tip: These yellow line are the representations of projectors. They assist in developing the design. Rotating the projection planes in its ‘Land Line’ will take the dihedral to a two-dimensional configuration (which can be represented in the plane of the paper). The name of this new configuration of the projection planes is ‘Épura’. 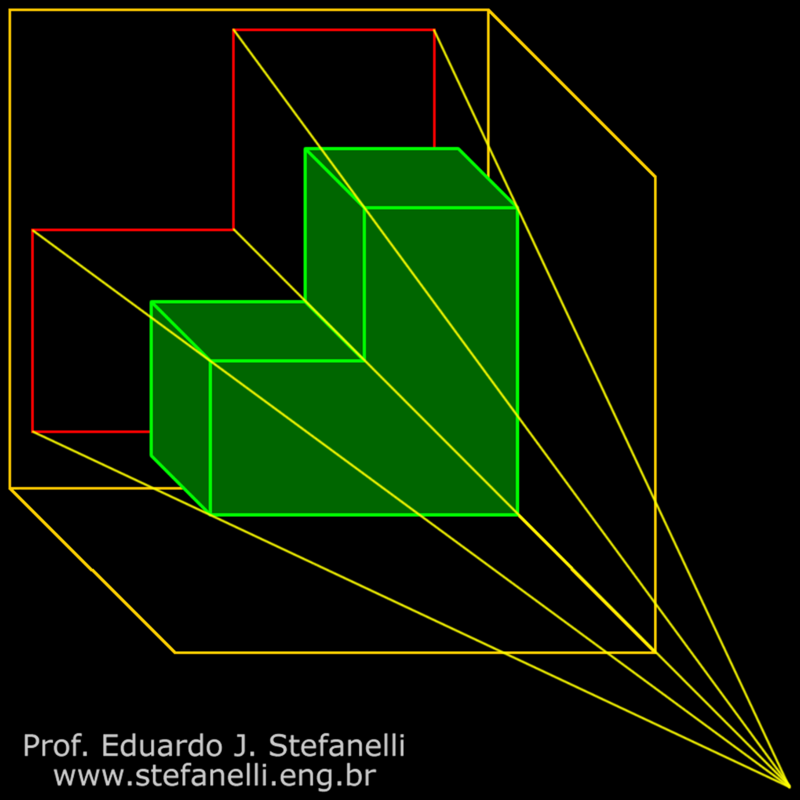 Withdrawing the projection planes (Épura), you get the orthogonal projections (or views) of three-dimensional object. Note that the front projection is a representation of how the object is from the front, the upper projection is how the object is on top and the profile projection is the side of the object. The yellow line is the projectors and are used to facilitate the completion of the design, they should be cleared on completion. Click the control for the orthogonal projections of the figure, without projectors. These fundamentals are used in the creation of engineering, architecture and boiler projects, among others; In the formulation of manual or digital-mediated (CAD) designs in 2D or 3D; In computer-aided manufacturing (CAM); In the production of physical or computer models of architecture, mechanics or piping. They also apply in interpreting technical drawings, architectural plans, planning drawings, true greatness (V.G.) and some graphics classes.